Thanks to the generous donations of community members, the Wallowa Fund has awarded two $500 scholarships for students planning to return to or remain in Wallowa County after completing their education. One scholarship is for a graduating high school senior and one is for a young adult (age 35 or younger). Cody Arbogast of Enterprise was the awarded the high school senior scholarship. Cody is preparing for a professional career in the horse industry. 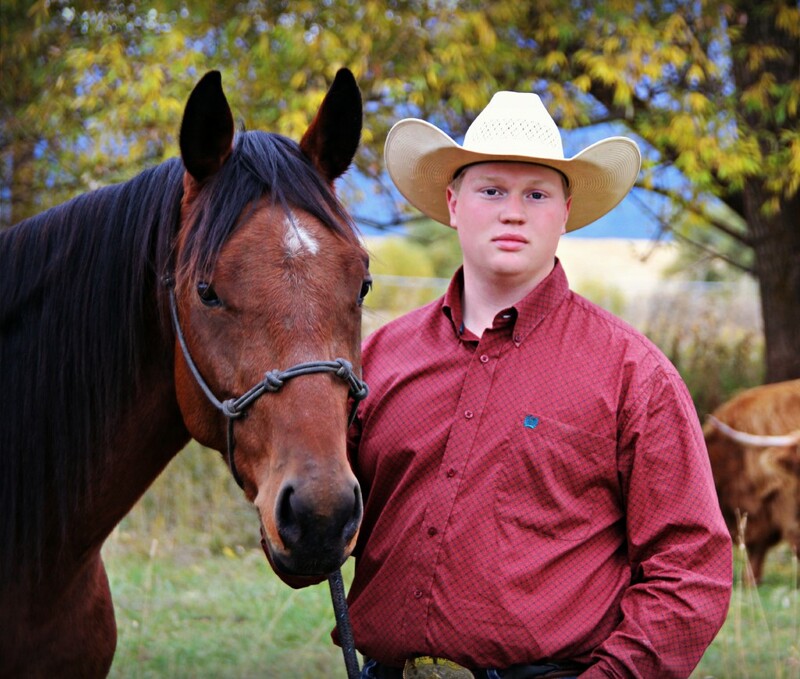 This fall he enrolled at Northwest College in Powell, Wyoming in the Equine Science program, and was recruited for the Equine Judging Team. As a member of the team he will have the opportunity to travel to regional and national judging contests, as well as to tour professional training operations and engage in judging practices with leading U.S. trainers. After college, Cody plans to return to Wallowa County to start his own training program and carry on his grandfathers’ legacy of working with horses. The goal of returning to Wallowa County is important to him. “Our schools and businesses need families to stay and make a home here. I am lucky that the career I have chosen allows me to live almost anywhere. I want to live here because of the sense of community. Many times I have seen the county step up to help out a neighbor in need. I want to live in that type of county. I want to support a community that has always supported me,” says Cody. 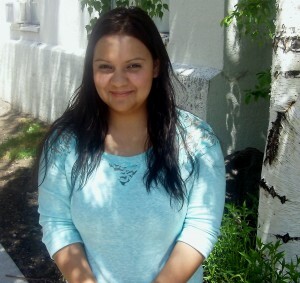 Jessica Mendez of Wallowa is the recipient of the young adult scholarship. Jessica is currently attending Columbia Basin College in Pasco, Washington. After finishing her prerequisites, she plans to transfer to Eastern Oregon University to complete a Bachelor of Science in nursing. Her long term goal is to become a pediatric nurse practitioner with the ability to provide bilingual services in Wallowa County. Jessica moved to Wallowa County as child and by the age of eight was already translating for her Spanish-speaking parents at medical appointments and school meetings. At first, Jessica questioned her parents’ decision to accept a job in such an isolated place, but after starting school, she met a teacher who changed her life. “I don’t think I would be the person I am now, if not for my teacher’s personal dedication and hours of nurturing. Learning a second language is difficult, sometimes painful. It allowed me to develop the philosophy that if we have a desire to learn, we can accomplish anything we set our minds to,” says Jessica. Now Wallowa County is home and Jessica wants to come back, raise a family and make a living here. She wants to be able to give back many of the gifts she and her family have received in years past and to be a role model for others, showing them that they too can better their lives through education. The Wallowa Fund would like to thank Joan Madsen at j.creative•graphic design & illustration for the wonderful Wallowa County brand logo that we are using for our new letterhead. The Wallowa County brand was first developed in 2007 as a community ‘owned’ brand representing: Our genuine rural community. Our optimistic spirit. Our majestic land of inspiring beauty. Products and services home grown with pride. Quality behind products, services and relationships with land and people. Value for rural life – vision for the future, family, quality of life , a simplified lifestyle, grounded. These values are definitely reflected in the community-defined priorities for the Wallowa Fund. In fact, clear back in 2007 people were already thinking that the brand could also be used to ask consumers to donate to a ‘special Wallowa County fund’ which would be used to support local projects. It’s great that the brand and the Wallowa Fund are now connected! Wow. An anonymous donor came forward with a donation for a Wallowa Fund scholarship. That got the Fund Advisory Committee volunteers so excited they decided to try and raise enough additional donations to offer two scholarships. Success! 2013 Scholarship Donors – Thank you! Your support is creating new opportunities for young people in Wallowa County! Thanks to the generous support of community members, the Wallowa Fund is now accepting applications for two scholarships, one for a graduating high school senior and one for a young adult (age 35 or younger). 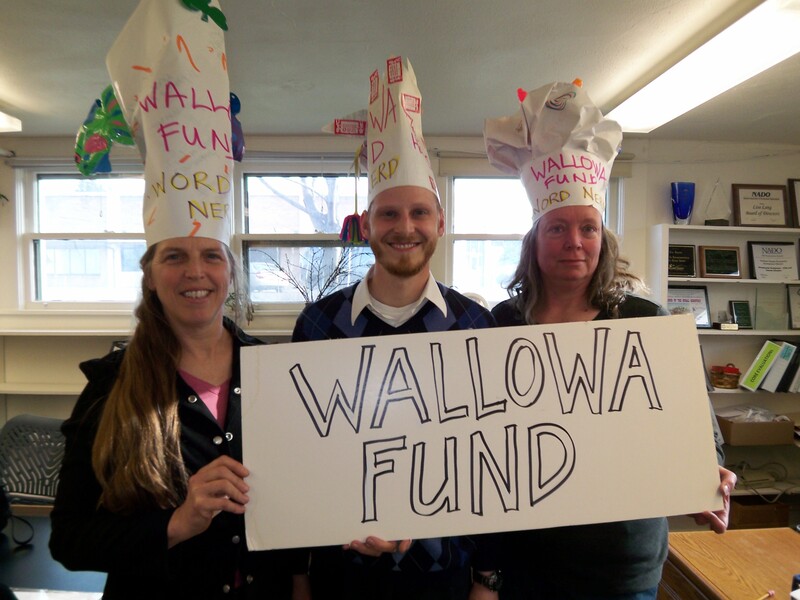 Educational and youth opportunities are one of the top priorities of the Wallowa Fund. The scholarships are for Wallowa County students planning to return to or remain in Wallowa County after completing their education or training. The scholarships can be used at any accredited education or training program (2 or 4 year college, technical school, certification program, etc.). The deadline to apply is May 3rd, 2013. The Wallowa Fund “Word Nerds” out-spelled 13 other teams at the Rotary spelling bee and won the top prize of $250 for donation to the Wallowa Fund. Winning word? Colloquy. Thank goodness we had our secret weapons of cool hats and “the Mossimator”. What would Wallowa County be like without the amazing community support that makes our County an incredible place to live? The Wallowa Fund would like to thank the generous in-kind donors who have helped us so far. Thank you Esprit Graphic Communications for donating the printing of our first full color brochures! Thank you Leon Werdinger, Ottertrack Productions; Jeff Baird, Joseph Digital; and Rick McEwan, Photoscapes, for donating your beautiful photographs for our website and publications! Thank you Ezekial Hale, Develop Easy, for donating the development of our website! Thank-you Tom Bingham, past Advisory Committee Member, for donating the hosting of the website! Your contributions are helping plant the seed of a resource that will keep on giving for generations to come in Wallowa County. Thank you. 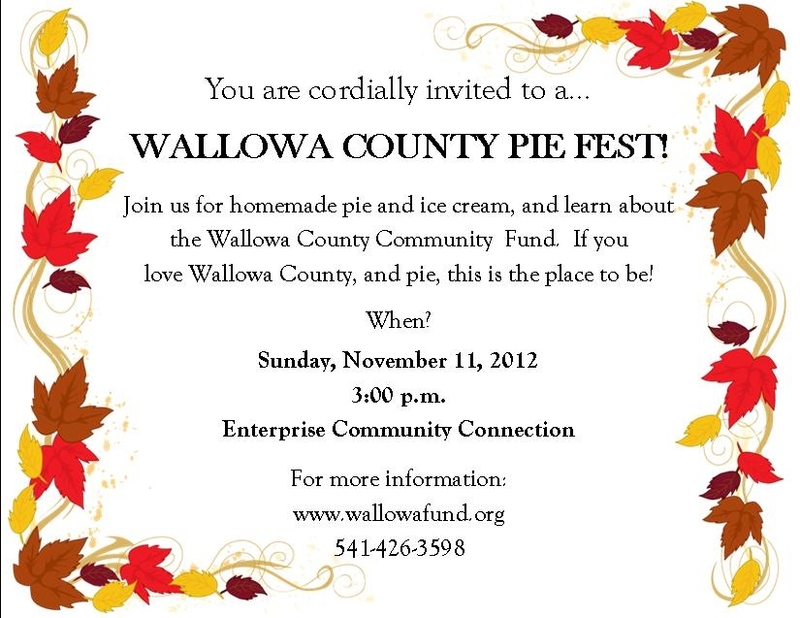 Join us at Pie Fest November 11th! Welcome to WallowaFund.org! We are so happy to have a website – where anyone can find information about the Wallowa Fund and our fundraising and community goals. A big thank-you to Ezekial Hale of Develop Easy, and to Tom Bingham, past Fund Advisory Committee member, for making this website possible.